A Humboldt County Sheriff’s deputy and a suspect were both hospitalized early this morning after a shootout at a residence in the 700 block of Ferndale’s Coppini Lane. The deputy, whose name hasn’t been released, is in stable condition, according to the sheriff’s office. The suspect, Hugo Parral-Aguierre, 30, was shot multiple times. His condition is currently unknown. The incident began when deputies were dispatched to the residence for a welfare check shortly after midnight and arrived at 12:50 a.m. According to the press release, the deputy was shot “shortly after arrival.” A standoff at the residence followed and Parral-Aguierre was taken into custody shortly before 4:30 a.m. and transported to a local hospital for treatment. It’s not immediately clear, but it seems Parral-Aguierre was suffered the gunshot wounds during the initial exchange that wounded the deputy. This is the second time this year a local officer has been wounded by a suspect, after Humboldt State University officer Louis Altic was shot in the leg during a fatal exchange with Ervin Eugene Sweat Jr. on Sept. 9. Altic has since returned to duty. From the Humboldt County Sheriff's Office at 3:11 a.m. Date: 12/17/17 Prepared by: S. Karges Case Number: Subject: Officer Involved Shooting The Humboldt County Sheriff's Office is searching for the suspect of an early morning officerinvolved shooting. Just after 12 a.m. today sheriff's deputies were dispatched to a residence on the 700 block of Coppini Lane in Ferndale for a welfare check. Deputies arrived on scene around 12:50 a.m. A deputy was shot shortly after arrival. The deputy was transported to a local hospital and is in stable condition. The suspect is still outstanding and is identified as Hugo "Pelon" Aguierre. Aguierre is described as an adult male, 5'3", with brown hair and brown eyes. Multiple local law enforcement agencies are assisting in the search. Residents in the Ferndale Bottoms area are asked to stay inside while the investigation is ongoing. We will release more information as the investigation continues. 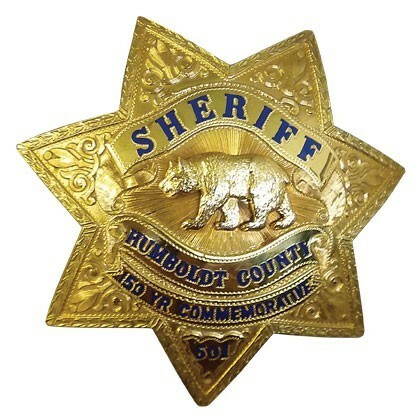 Anyone with information is asked to call the Humboldt County Sheriff's Office at (707) 445-7251. From the Humboldt County Sheriff's Office at 4:50 a.m. Date: 12/17/17 Prepared by: S. Karges Case Number: Subject: Officer Involved Shooting Update Ferndale officer-involved shooting suspect Hugo Parral-Aguirre was located just before 4:30 a.m. and taken into custody. Parral-Aguirre was transported to a local hospital with multiple gunshot wounds. The investigation is ongoing. Anyone with information about this incident is asked to call the Humboldt County Sheriff’s Office at (707) 445-7251.